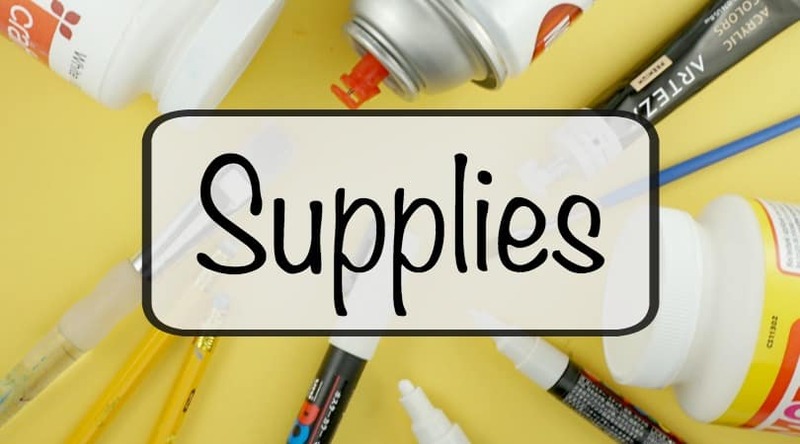 Create a watercolor effect with Posca paint pens or regular acrylic paints. 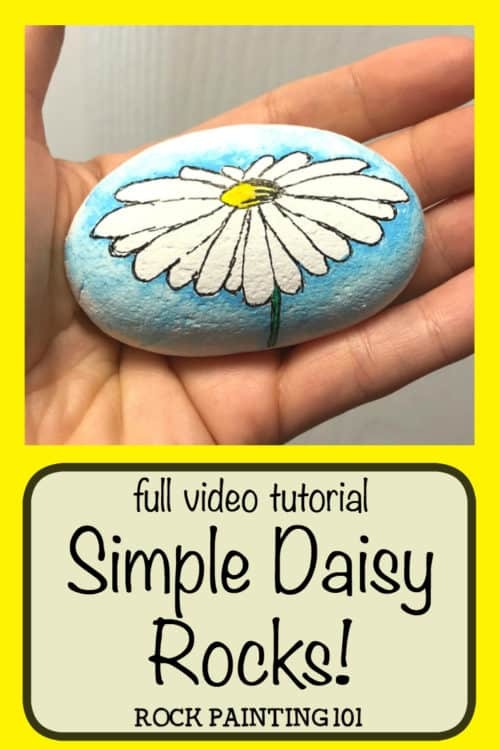 This easy tutorial will walk you through a fun technique by painting a daisy rock. Watch the video and find out how easy this process is. 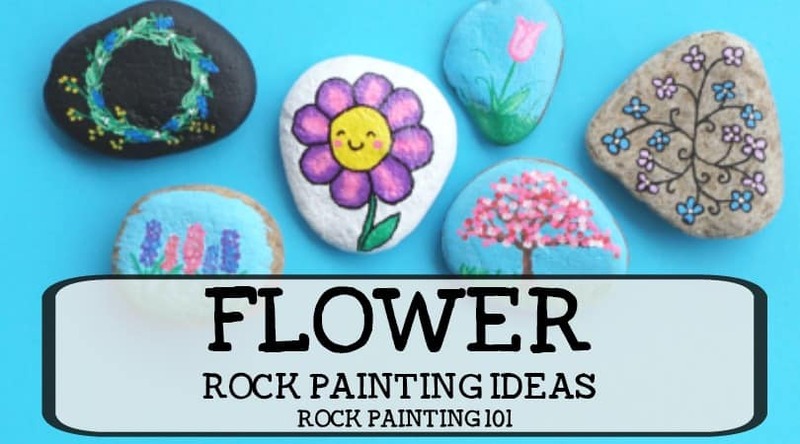 It’s perfect for rock painting beginners! Daisys are such a fun flower. They remind me of summer and being outdoors. The daisy is typically a simple flower to draw. But instead of the traditional straight on approach, I wanted this stone painting idea to have a bit of a twist. So I painted it at a side angle. 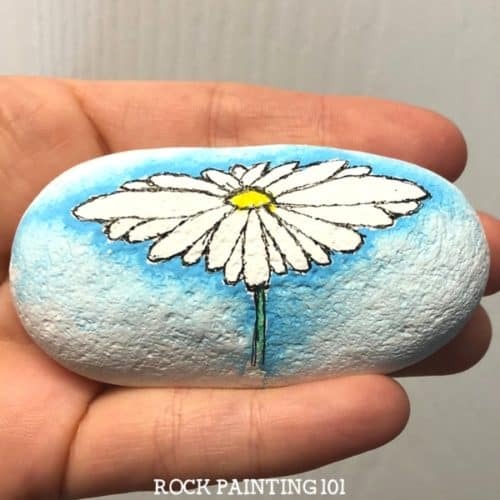 Adding the watercolor effect is a fun way to make the white daisy pop on a white rock. I base coat my rocks with this quick and inexpensive method. 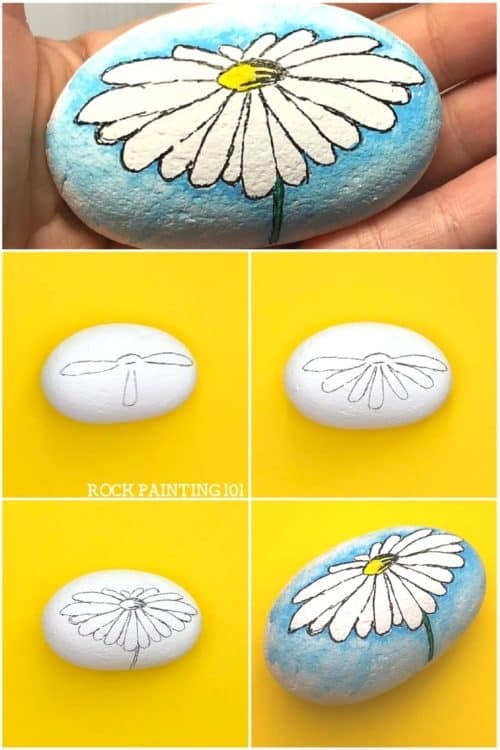 This step by step tutorial is for drawing a daisy on a rock. You can also watch the tutorial in the video below. I’m using a Micron pen to draw this daisy, because of it’s finer tip. But as always, be careful when using this pen. If you push too hard, you will damage the tip. Start by drawing an arch as the center of your daisy. Then draw the top of the first petal off from the side of your center arch. Followed by the top of the second flower petal from the opposite side of the arch. Draw another, smaller, arch under the original arch to complete the center of the flower. Find where you want your bottom petal to land. Create a small mark there so that you can visualize as you draw the bottom daisy petal. Split the space between the bottom petal and the side petal and create a little mark. You are going to draw two petals here, using the mark as the divider. Create marks straight out from the center to give you a visual of how long you want these petals to be. They shouldn’t be drawn right next to the side and bottom petals, because that may cause these petals to curve, and you want them to go straight out from the center of your painted daisy. Now go in and draw petals in between the petals you just created. These are the second layer, so you will only see the tips in between the other flower petals. Make sure to visualize that they are going to the center of the daisy. 101 Tip! 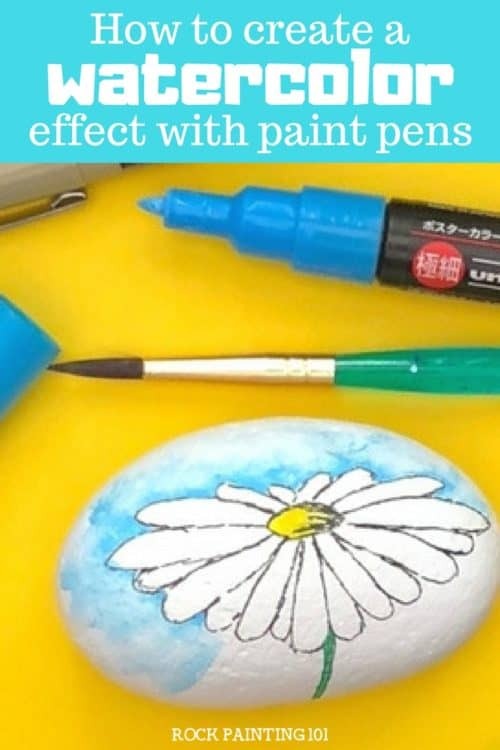 : Try turning your rock as you paint the petals. This way you are always using the same motion towards the center and will create a more natural look. Because this style of daisy is more of a side view, the top petals are going to be shorter than the bottom ones. Simply draw them across the top of the daisy. Create a beautiful and simple watercolor effect using paint pens or regular acrylics. You can also watch the tutorial in the video below. You can grab the Posca pens that I used on this painted rock here. Now it’s time to make this daisy pop off of your white rock. If you’re using a regular acrylic paint, you will want two brushes. One that will be your wet brush and one that will be your regular paint brush. Don’t use the same brush for both. In my video, I use a Posca paint pen. Any time I grab my pen, you grab your regular paint brush. Start with your wet brush and put a small dab of water onto the center of the daisy. Follow that with your yellow paint and just lightly dab the color into the center. You don’t need a lot. We just want a little pop of color. 101 Tip! : If you feel like you dabbed too much water, grab a small piece of paper towel and just touch it to the wet spot. Then you can either redo it or touch it up. Repeat this process on the stem with some green paint. For the blue background, I’m going to start at the stem and work my way around the daisy. This way you do not end up with a line somewhere weird on your rock. 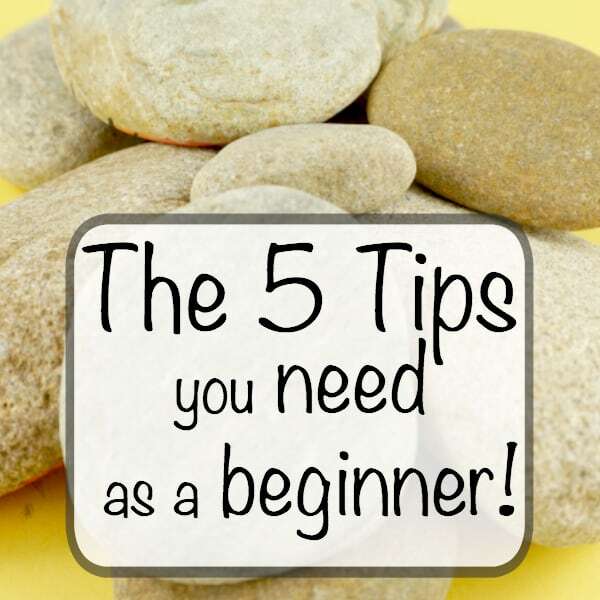 You’ll have a natural start and stop point. To create the watercolor effect, you want to work back and forth between the wet brush and the regular paint brush or paint pen. Grab your blue paint and get as close to the black line of the petal as possible. I like to do a few petals at a time. You can always touch up if you accidentally go over the black. Now grab the wet brush and dab it a bit on a paper towel. You want it damp, not dripping. Use your wet brush to lightly pull the blue down onto the rock. Come back with your blue and do the next few petals. Keep repeating this process all the way around your painted daisy. 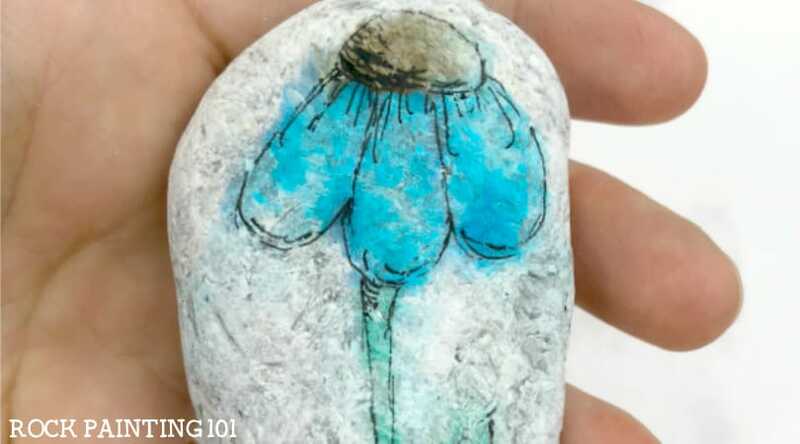 Once you’re all the way around, give your painted rock a moment to dry. This will only take a minute with the paint pens but will take longer with regular acrylics. When the paint is dry, come back with your Micron pen and touch up the outside lines. If you create one of these rocks, please share it with us!! Leave a picture in the comments of our Facebook Live! 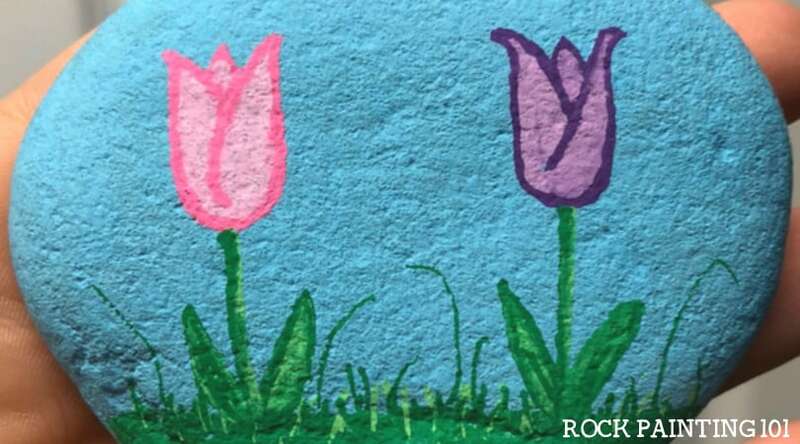 Pin this Flower rock to your favorite Pinterest board!